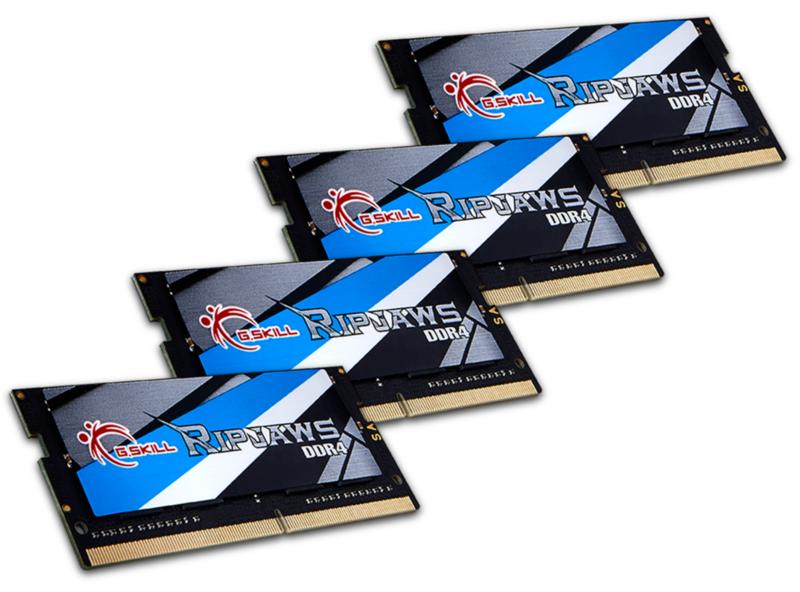 G.Skill has announced their latest Ripjaws series DDR4 SO-DIMM memory kit which is the fastest to date. The new memory kit is specifically designed for high-performance, Mini-ITX boards that come with support for SO-DIMM memory form factor. The Ripjaws SO-DIMM memory is targeting a very select range of Mini-ITX motherboards that offer SO-DIMM memory support. Of all the current generation motherboards based on Intel and AMD chipsets, there are only a few that come with SO-DIMM memory layout. The recently launched Intel X299 motherboard from ASRock, the X299-E ITX/ac is one of them. Featuring support for up to four SO-DIMMs, the motherboard can take full advantage of such high-performance memory when it is paired with a fast Intel Core i9 series processor. Talking about the memory itself, the DDR4 Ripjaws SO-DIMM memory is available in three different specifications. All of them are using the ultra-high performance Samsung B-die DDR4 ICs. All three kits are maintained at 1.35V and available in different clock speeds of 3200, 3600 and 3800 MHz. The fastest 3800 MHz kit maintains CL18 timings while the other two kits maintain CL16 times and all of them come in 32 GB capacities (4 x 8 GB). The 3200 MHz kit is also available in a 64 GB kit for users eyeing higher capacities on their Mini-ITX build. The memory kits are expected to hit retail in December of 2017 and we can hope that there will be more boards that come with SO-DIMM form factor coming out soon. Taipei, Taiwan (20 October 2017) G.SKILL International Enterprise Co., Ltd., the world’s leading manufacturer of extreme performance memory and gaming peripherals, is thrilled to announce the release of a new high performance DDR4 Ripjaws SO-DIMM series for small-form factor (SFF) platforms, at DDR4-3800MHz CL18-18-18-38 32GB (4x8GB) at 1.35V, making this the world’s fastest SO-DIMM memory kit. In addition, 3 new specifications will be added to the Ripjaws DDR4 SO-DIMM family, including DDR4-3600MHz CL16-16-16-36 32GB (4x8GB), DDR4-3200MHz CL16-16-16-36 32GB (4x8GB), and DDR4-3200MHz CL16-16-16-36 64GB (4x16GB). Such extremely high speed on SO-DIMM modules are achieved with the use of the ultra-high performance Samsung B-die DDR4 ICs. 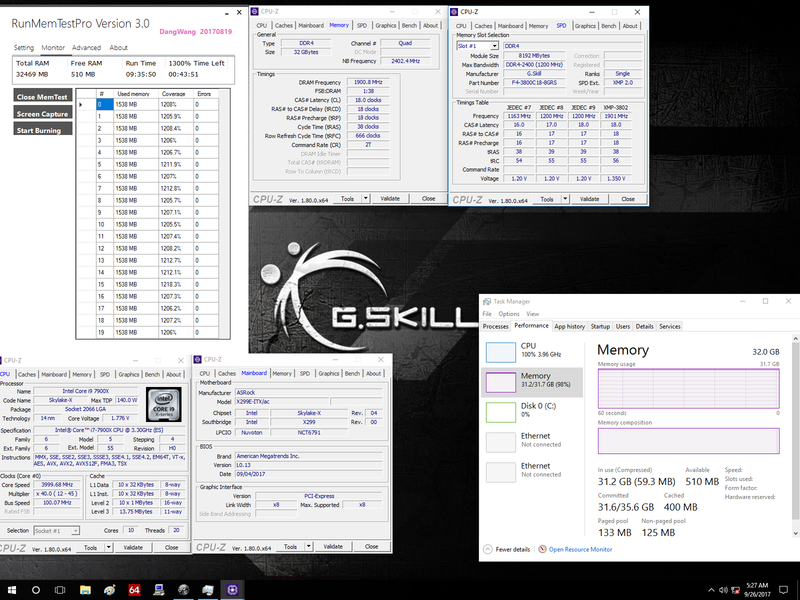 The following stress test screenshot shows the new DDR4-3800MHz memory kit in action with a total runtime of over 9 hours. This high-end Trident Z RGB memory kits will be available via G.SKILL authorized distribution partners in December 2017.